Australian Turf Club has established ATC Foundation to oversee collections and programs for charitable organisations as the Club enhances its support of racing and local communities across Sydney. 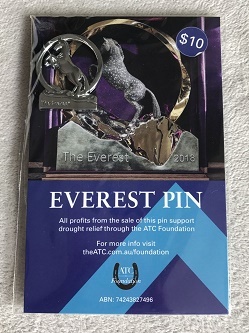 From this Saturday, October 6, The TAB Everest charity pins will go on sale at ATC racecourses for $10, with all profits directed to drought relief. “ATC Foundation was the concept of our former Chairman Laurie Macri who first championed this initiative under our Community Engagement program,” ATC Chairman Matthew McGrath said. The funds raised will be in addition to the $1 million drought relief fund established by Racing NSW. “The thousands of people coming to see The TAB Everest will have a chance not only to support their favourite horse, but also our farmers and participants in the bush by buying an Everest charity pin for $10,” Racing NSW CEO Peter V’landys AM said. ATC Foundation will further assist the racing industry and support charities and local community projects through initiatives such as: sale of souvenir raceday pins and merchandise; auctions including saddle cloths; and promotions around some of Sydney’s biggest races including the Longines Golden Slipper and The TAB Everest. It will also aim to raise the profile of racing amongst future generations as a dynamic industry with diverse career opportunities. Mr McGrath said ATC Foundation was linked to the Club’s efforts through its employees and Members to donate more time and resources to local communities, particularly around Rosehill Gardens, Royal Randwick, Canterbury Park and Warwick Farm racecourses. “We are at our core a thoroughbred racing Club, but beyond that we want to take an even greater role in helping the people and organisations in our local communities,” Mr McGrath said.